Home - Phipps Boat Works, Inc. Welcome to the Phipps Boat Works website! We are a marine maintenance facility located at the Herrington Harbour North marina in Tracy's Landing, MD. In May of 2012, we celebrated our 30 year anniversary at Herrington Harbour. We look forward to serving you with all of your boating needs for the next 30 years and beyond! 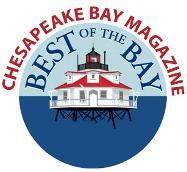 Voted 'Best of the Bay' by Chesapeake Bay Magazine! "I wanted to take the time to express my absolute glee with the job Buster, and the employees of Phipps Boat Works did on the replacement, and repair of the windows on Avalon. The job is perfect, the look is fantastic, and my crew is all in amazement."